← CERT Training in SeaTac starts in May! 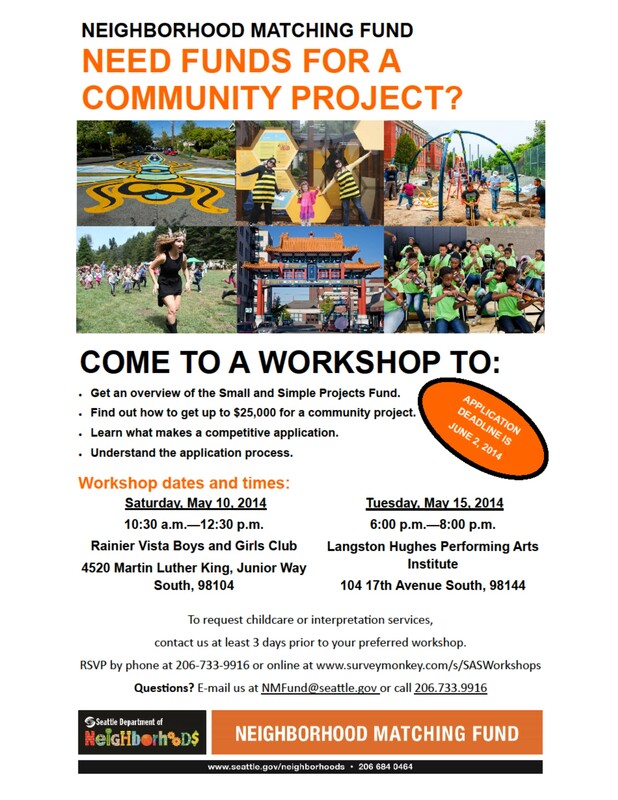 The Neighborhood Matching Fund, a program of Seattle Department of Neighborhoods, is hosting the second of two workshops tonight for those interested in applying to the Small and Simple Projects Fund this June. The Small and Simple Projects Fund provides matching awards of up to $25,000 to neighborhood groups and community organizations for community-building projects. At the workshop you will get an overview of the Neighborhood Matching Fund, the qualities of a good project, and the application process and requirements. To RSVP call 206-733-9916 or go online at www.surveymonkey.com/s/SASWorkshops. The deadline for applications is Monday, June 2 at 5:00 PM, but make sure to register early on their web-based application system. There will be one more opportunity to apply to this fund on October 6. This entry was posted in Announcements, Community Resources and tagged Neighborhood Matching Funds, Seattle Department of Neighborhoods, Small and Simple grants. Bookmark the permalink.